I read this article and found it very interesting, thought it might be something for you. The article is called Automated Reverse Image Search Part 2: Vimeo and is located at http://www.automatingosint.com/blog/2016/04/automated-reverse-image-search-part-2-vimeo/. In a previous blog post I covered how to utilize the YouTube API to find the preview images for videos and then reverse search them using the TinEye API. In this blog post we will cover how to use the same techniques for Vimeo to retrieve the location of the preview image, and then we will use our previous code to submit it to TinEye for reverse searching. This can assist you in determining whether you are looking at a brand new video or something that has been reposted from an earlier point in time. Let’s get started. The main drawback of using the Simple API is that it is only useful on public videos. If you require your script to work with private videos or to do more advanced querying against Vimeo you will need to get an API key and check out the developer docs. Pretty awesome right? We have a bunch of useful information stored here. In particular we are interested in the thumbnail_large key as this will give us the image that we can use to submit to the TinEye API to see if we have additional results or other sites that contain the image. As well you will notice an upload_date which you can use to verify whether this video went up before other results that you find in your reverse image searching. Line 17: we define our get_vimeo_video function that takes in a video_id parameter that represents the Vimeo video ID we have covered previously. Lines 19-21: we are building up the URL to retrieve the video JSON (19) and then we send the HTTP request off (21). Lines 23-29: if our request was successful (23) then we store the parsed JSON in the video_info variable (25). We output the date that the video was uploaded (27) and then return the location of the large preview image for the video (29). # Search TinEye for the image. print "[!!!] TinEye search failed!" Line 39: we create our search_tineye function that receives an image_url parameter that is the location of the Vimeo preview image. Lines 41-45: we send off our request to the TinEye API (42) and if there are any problems with our call (usually because you copy/paste your API keys incorrectly) then we output an error message (44) and return (45). Lines 50-57: we walk through the list of TinEye results (50) and each result can contain links that we also walk through (52). We begin adding new links to our result_urls (56) as well as adding the date of the link to the dates list so that we can find the oldest post later. print "[!!!] No results found on TinEye." Line 59: we are testing here if we have items in our result_urls list which indicates that we have hits from our TinEye request. Lines 60-65: we print out the number of hits (61) and then walk through the list of results (63) and print out the URL where the image was found (65). Lines 68-71: we sort the list of dates (68) which will put them in chronological order, so that we can print out the oldest date (71). That’s it! 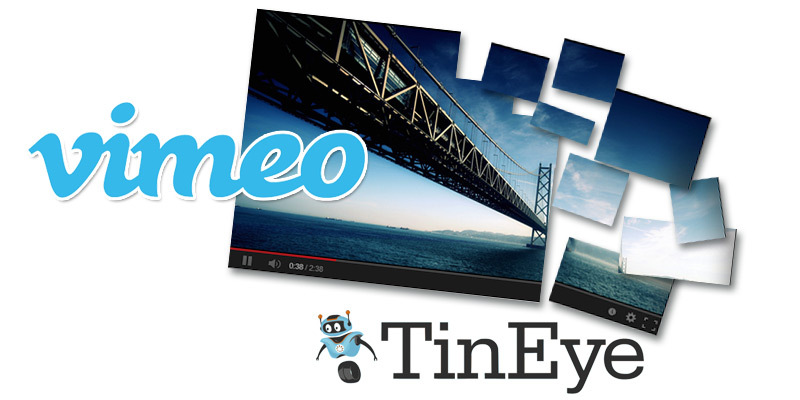 We call our get_vimeo_video function to retrieve the preview image URL and then pass it off to our search_tineye function to do the search on TinEye. Let’s see what happens when we run it. [*] Discovered 2 unique URLs with image matches. Cool so we can see that the video was uploaded on July 28, 2013 and we see that the oldest detected image was from February 7, 2014. This could be an indicator that the video on Vimeo was put online before it was put on the other sites detected.